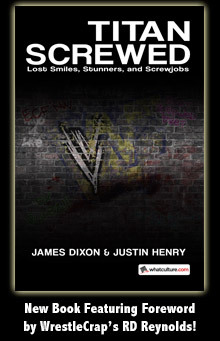 Headlies: TNA Debuts "Good News Gunner" - WrestleCrap - The Very Worst of Pro Wrestling! 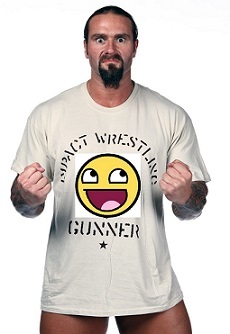 Orlando, FL – At the most recent taping of Impact, TNA debuted the newly repackaged version of Gunner in grand fashion. The new gimmick is a big departure for 4-year veteran of TNA and ROH alumni. Gunner, who previously wrestled under the name “Phil Shatter” was better known in TNA as “the guy who isn’t Murphy” and “the guy standing next to James Storm”. In recent weeks, Gunner’s real-life status as an Iraq War veteran began to come out in storyline, but was quickly dropped. 14 Responses to "Headlies: TNA Debuts “Good News Gunner”"
Blah blah blah, more TNA hate. I don’t watch WWE but I regularly watch TNA, since Hogan left it’s gotten better. Now that Dixie is gone from TV and they are bringing in some fresh faces, it looks like upward momentum. People have been saying for years that TNA is dead, but it remains. It’s like those people who keep saying Pro Wrestling NOAH is dead. It’s tired. TNA has a loyal fanbase and they won’t be going anywhere. I admit, Hardy as Willow seems pointless, but they’ve been doing some good stuff. I like the Wolves and being a puroresu fan, I was stoked to see Sanada Seiya. As for Gunner, I’ve been liking the background reveal they’ve been doing with him. Hopefully he gets a bit more exposure and grows into a contender. Sam Shaw’s character is great and Bobby Roode has really grown on me. Next year people will be saying “TNA will close in 2 months” but it’ll keep going. It’s not hate. It’s good news! There’s nothing wrong with liking TNA Wrestling, just like there’s nothing wrong with liking minor league baseball or arena football. There is no doubt that TNA was never and will never be competition for WWE. In fact I never want TNA to be the competition. I want TNA to be the alternative. I want TNA to be focused on pro wrestling, not soap opera antics. I want TNA to be a place free of nepotism, necrophilia and someone getting a main event spot because he whored his way into the bed of the boss’ daughter. I want TNA to be a place where different people get a chance to shine instead of the same old crap force fed down people’s throats. Wanna know why I don’t watch WWE? One reason is because I know the end of the matches already…Cena wins. That’s WWE in two words. Cena wins. Think Bryan is going to have the title? He may get it at Wrestlemania, but then as soon as the next PPV buyrate is a little low, or a quarter hour rating of RAW dips a little after Bryan has the gold, he’ll lose it back to Orton or Batista and then Cena will win again. Cena with the title by SUmmerslam is my prediction. Meanwhile Cesaro, Bryan, Reigns, Ambrose and Wyatt will be given quick pushes and shoved back down to midcard hell before anyone realizes it. So I choose to follow puroresu and the minor league of wrestling in the US. Sorry for the rant, I don’t know where it came from. Not being a backer of the Fed here and I do like a lot of the talent in TNA, but to say it avoids the soap opera stuff is inaccurate. They had a show recently where I swear they had more minutes of commercials in the two hour span than they did actual in ring action. The rest was just inane vignettes where someone always manages to have a camera ready to roll tape, even in someone’s secret room in their house where they keep “personal trophies” taken from unsuspecting women. That’s pretty soap opera to me. The good news is Lockdown got more buys than our last One Night Only show! TNA may still be alive, but they’re still not a professional product. People always say TNA Is going under? Well, a lot of other people keep saying that they’re getting better. There might be a worse promotion. Out there, but I don’t know where. But I don’t like bananas! So your banana splits are just splits. If he starts every one of his speeches with “Good News Everyone” ala Professor Farnsworth, then he becomes my favourite TNA personality. Heck he might make my top 3 wrestling personality.